A doodle is a mixed breed of a poodle and something else. They're very beloved pets, often called "designer dogs", and have a number of different types. 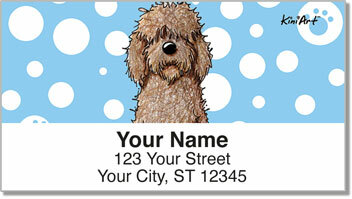 Labradoodle- Mixing labs with poodles, they are sociable, friendly, and intuitive. Aussiedoodles- By breeding Australian shepherds and poodles, you get an extremely intelligent dog. 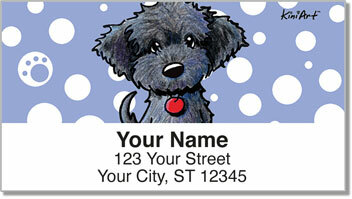 Schnoodle-Made by breeding a Schnauzer and a poodle, they often make great watchdogs. Goldendoodles-One of the most popular breeds combing a golden retriever and a poodle, they are often more hypoallergenic. Barnedoodle- A rarer cross between a Bernese mountain dog and a poodle. They can be great family dogs but only if they're socialized at an early age. 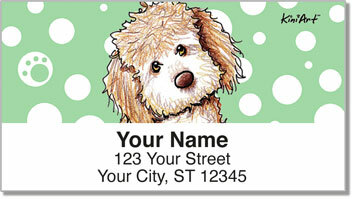 No matter what breed you fall in love with, you can find many of them here with Artist Kim Niles, creator of KiniArt, and her adorable designs on our address labels. Self-adhesive and easy to use, they make sending mail more fun and allow you to send adorableness into someone else' day. 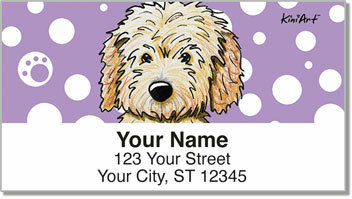 If you're definitely a dog person, get these labels today!